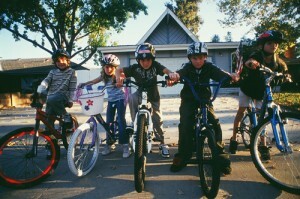 Bike gangs are terrorizing Boulder County town. Some Boulder County voters are being forced to confront an issue so serious in nature, so heinous in magnitude, that it requires an actual election to determine how it should be handled — whether bicyclists should be forced to ride single file through town. That question is being put to the residents of Ward, where apparently packs of wild, untamed pedal pushers are wreaking havoc on the town by riding two, three, 500 people abreast. This cannot be allowed to continue, suggests the question to voters. According to the proposed ordinance, these recreationists and green commuters are creating a hazard for gas-guzzling cars, pedestrians and pets, and uhm, bicyclists. That’s right, bicyclists are a danger to bicyclists. Cyclists would only be permitted to ride two abreast on bike paths and during bike races, because even Ward concedes that it’s not much of a race if you can’t actually pass anyone. It doesn’t appear the new ordinance would be strictly enforced and any fines collected would go to the county, not the town, and they don’t seem too concerned about the loss of bicyclists who might boycott the area and thus affect the economy. City leaders argue that what they really want is just to put up some signs telling bike riders to stay in single file, because if bikers know it’s the law, they will follow it. It’s already the law to only ride two abreast in the state, but in the unique world of Boulder County where reality ceases to exist, it doesn’t matter that the more liberal law is already flouted. What’s needed are stricter laws and more signs. Yeah, more laws are the only effective detterrent to criminal behavior.